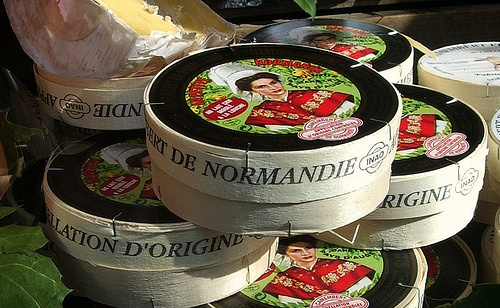 What is it about the cream from Normandy that makes it so special? 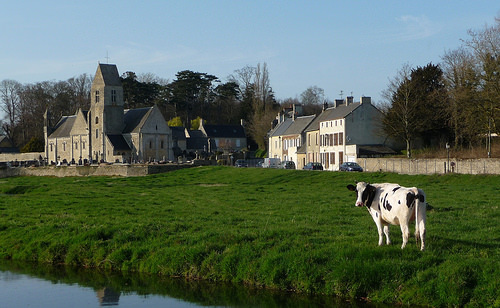 First, there is la Vache Normande, the Normandy cow. Brown and white spotted Normandy cows, easily recognizable by the unique markings around their eyes, called spectacles or lunettes, produce milk that is exceptionally high in butterfat. And they produce a lot of it, around 7 gallons a day. In the spring and summer the cows graze on sweet, fresh grass and in the winter they are fed hay or sugar beets, all of which give the milk a delicious, distinctive character. 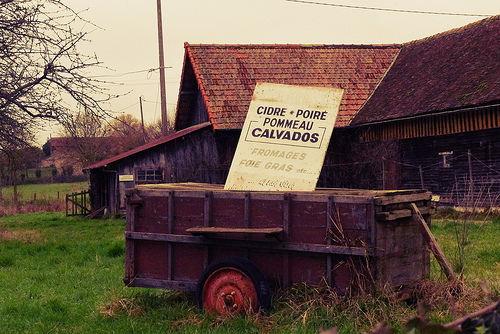 Apple and pear orchards, usually with a cow or two grazing under the trees, are the ubiquitous image of the Norman countryside, and a visit to Normandy wouldn’t be complete without sampling the local refreshments – cider, pommeau, poiré and calvados. Here’s everything you need to know about the region’s quartet of fruity libations. Cidre de Normandie: Cidre, or cider, is a sparkling, alcoholic beverage made from crushed apples that is fermented for 2-3 months before being bottled. 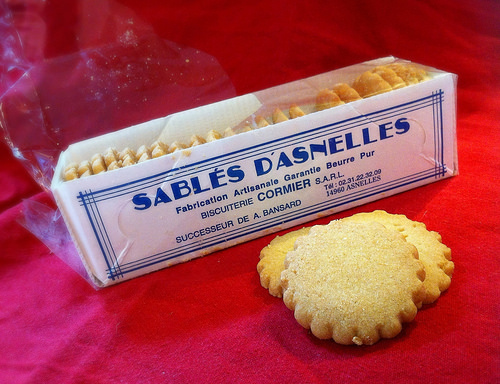 It is produced on farms and in homes all over the region, comes in numerous versions, degrees of sweetness and alcohol contents. 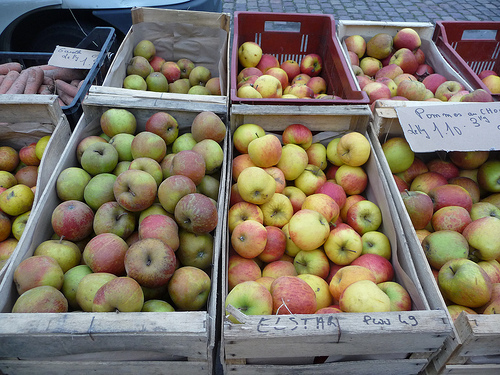 About 750 varieties of apples can be used to make Normandy cider, but only 50 of those are allowed in the production of AOC cider from the Pays d’Auge. This rural French auberge, located in the beautiful Norman countryside near Pont l’Évêque, offers fresh, classical French cuisine prepared by chef/owner, Nicolas Vincent. The rustic half-timbered dining room is cosy and lit with a big fire in the winter, and bright and airy in the summer, when the doors are thrown open on to the terrace on sunny days. Dishes include regional specialties, seasonal seafood, homemade pork terrine served with sweet and sour confit d’oignons, and a light, fruit studded mousse au fromage blanc for dessert. 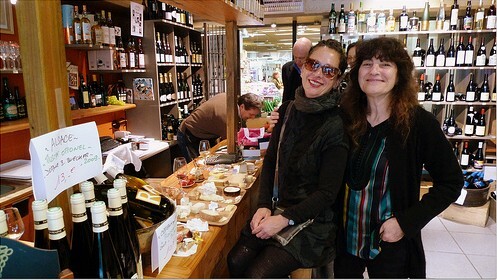 Peggy and Jérémy Thomas are no strangers to the cheese business. Jérémy, an artisan fromager, spent several years learning the ins and outs of the business at his uncle’s cheese shop in Paris (the now closed Fromagerie Pascal Trotté) as well as at Rungis. His wife, Peggy, is a third generation fromagère in her family, following in the footsteps of her grandfather, her uncle and her father. 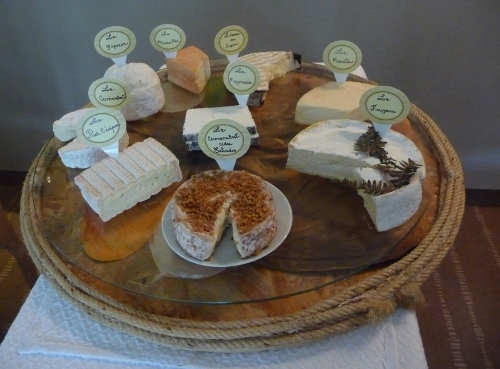 The shop offers cheese from all over France as well as the famous cheeses of Normandy and local farm produced fromage. 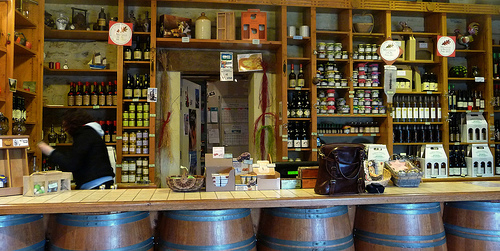 They also sell locally made yogurt and crème crue, as well as cider and wine. This quaint and very aromatic museum was created in 1986 through donations from local Camembert producers in order to preserve the important history of this regional AOC cheese. Signs posted throughout explain the steps of fabrication – from the separation of curds and whey, the traditional hand ladling (rather than pouring) into molds, the ageing and what materials are used and why. 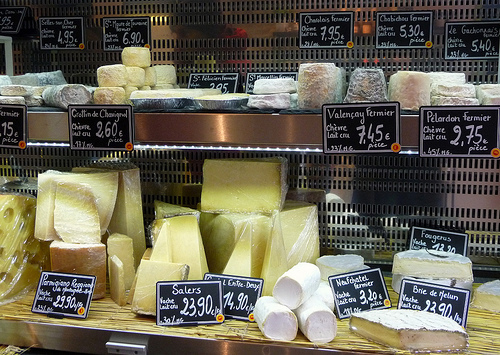 Additionally, there are over 3,000 labels from different Camembert producers on display. The museum is still mainly staffed by volunteers, so it is closed in the winter and has rather limited hours in the summer, open only between 2-5:30pm. At the height of the tourist season, a wedge of camembert served with a glass of local cider is offered to visitors. 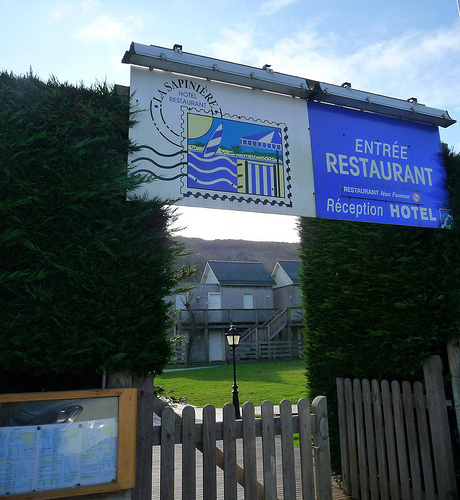 Located just 20 yards from Omaha beach, La Sapinière is one of a few places to stop and enjoy a meal in an area along the D-Day beaches that sees a large number of international visitors, yet isn’t known for great restaurants. It offers generous portions of simply prepared, traditional food, all made in house with fresh ingredients, and a very friendly, English speaking staff. Take advantage of the large terrace on a sunny day, and when the rain is falling, as it often does in Normandy, settle in next to the fire in the bright, cabin style dining room. 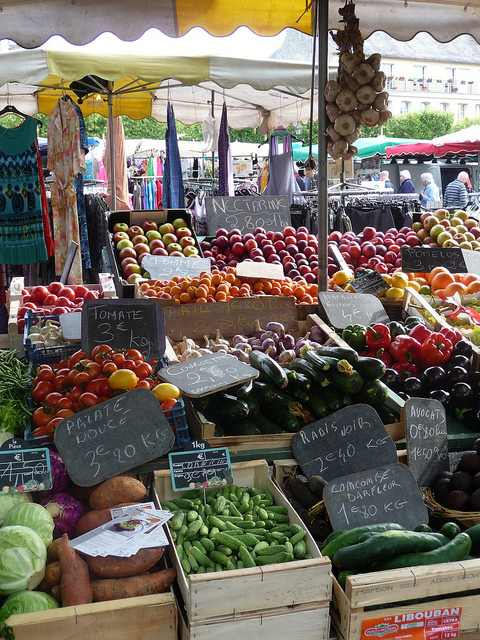 Every Saturday morning, rain or shine, la Place Saint Patrice, which serves as a parking lot during the rest of the week, transforms into a bustling weekly market. The entire perimeter of the square is taken up by food – local cheese producers and large trucks selling fromage from all over France; Normandy cider and Calvados producers offer samples of their products; local fruit and vegetable growers and organic farmers set up long tables. 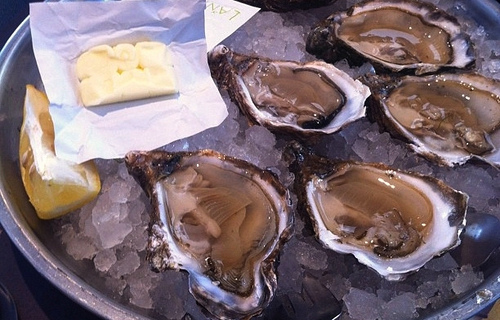 You will find fresh seafood trucks offering an array of Normandy seafood and others with just one item such as local mussels or petit gris, and at one end of the market there are live poultry and rabbits for sale. 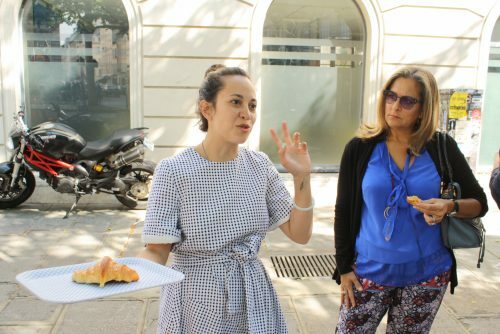 There are vendors selling wine, bread, charcuterie, cut flowers, herbs and plants for the garden, prepared food such as pizza, paella, choucroute de la mer, sweet and savory crêpes, even spicy samosas and curry made by a woman who comes from the Reunion Islands. In the center of the square you will find new and used books for sale, seasonal clothing, shoes and slippers for men, women and children, jewelry and scarves, pottery, handbags and market baskets. 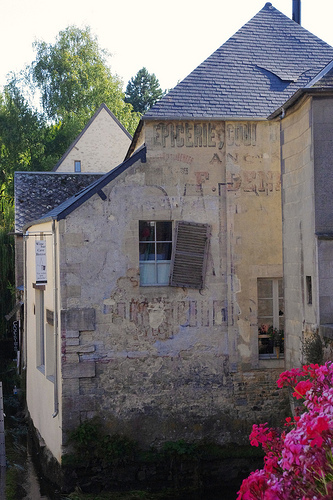 In the historic center of Bayeux, wine connoisseur and caviste, Pierre-Henri Lemessier, has transformed a little house overlooking the river Aure into a wine bar and bistro offering simple, delicious food to accompany his well stocked selection of French wine. At lunchtime a generous plat du jour is served with a glass of wine for only €9,80, and in the evening you can enjoy a 3-course menu for €18. Also available are charcuterie and cheese platters, salads, omelets, escargots and crôques-monsieur, many of which are served all afternoon long in the comfortable dining room. And don’t leave without trying the specialty of the house – le sorbet au vin. A mix of old stone and classic refinement, this restaurant, housed in a 17th century manor that was once home to the local blacksmith, offers an exemplary dining experience from the moment you walk through the door. The passionate owners, Denis and Christine Leclerc, have been serving exquisitely prepared, sophisticated, seasonal dishes for 30 years in the bright, spacious dining room overlooking the gardens. They offer an eclectic array of apéritifs, an extensive wine list and a sublime specialty of the house – a fricassee that combines sole fillets and local foie gras – it can be ordered either à la carte or as part of the €49 menu. 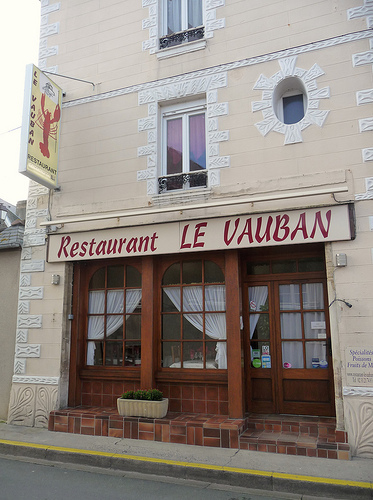 Normandy cream and fresh seafood are the stars of the show at le Vauban, an old fashioned restaurant tucked away on a tiny street just up from the daily fish market. The owners, Dominique and Patricia Gancel, and their staff, will make you feel right at home as they show you to your table in one of the two cosy dining rooms. The food here is unpretentious and the servings are generous. Authentic Norman dishes such as homemade soupe de poisson topped with a healthy dollop of crème fraîche, local fish with beurre blanc, towering fresh seafood platters and poulet Vallée d’Auge are some of the highlights of the menu. 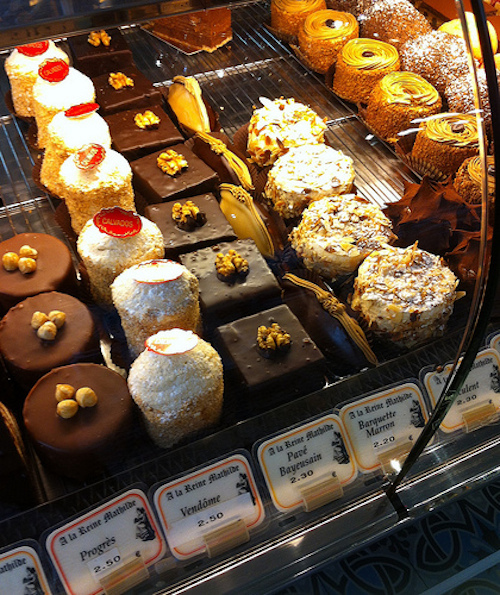 A lavish pastry case lines one wall of this delightful pâtisserie and tea salon located on the busy rue Saint Martin, in the center of Bayeux. The multicolored frescoes, painted clouds and gilded decor preserve the old world charm and are original to the shop, which opened in 1898. Special local pastries include la pomme d’Or (a rich chocolate mousse enrobed in dark chocolate with a heart of Calvados infused sponge cake), le pavé Bayeusain (buttery praline mousse sandwiched between delicate, thin layers of cake and wrapped in dark chocolate), and la tarte aux pommes Normande – quite possibly the best apple tart you will ever taste. Brothers Michel and Philippe Legallois are the 6th generation cider producers at their family farm, located just one kilometer from Omaha beach. More than 30 apple varieties are cultivated for their cidre bouché, which is made without the addition of extra sugar, resulting in a style of cider that is meant to be enjoyed with a meal and not just as an apéritif. 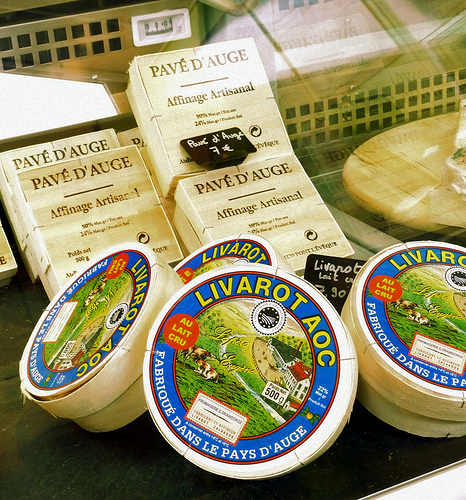 The brothers also produce AOC Pommeau and AOC Calvados, which they sell at their well stocked boutique alongside other local products such as andouille de Vire, caramels from Isigny-sur-Mer and confiture de lait. Visits to see the farm and the cider making equipment are possible all year long. 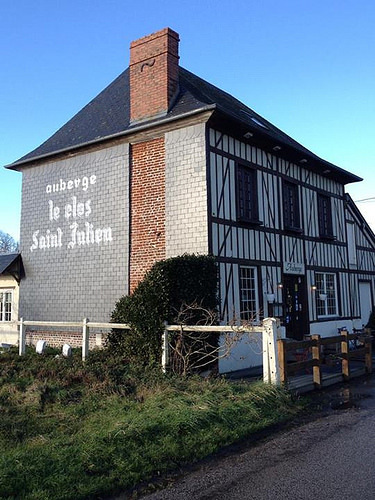 Just up the street from the Bayeux cathedral is the home and “urban farm” of Christèle and François Lecornu, 3rd generation cider and Calvados producers. The couple have over 3,000 certified organic apple trees on 9 hectares just outside of Bayeux, but their old stone house in the center of town is where the action takes place – the ageing and tasting. Guests are invited to sample the refreshing, sparkling cider, oak barrel aged AOC Calvados and homemade apple apéritif in their comfortable, old-world tasting room. 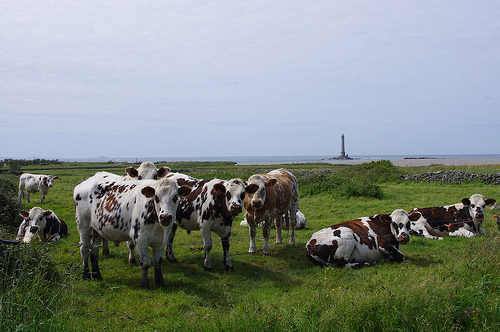 In 1932 a group of 42 farmers banded together and founded this dairy cooperative with a specific goal in mind – to promote and protect the unique terroir of mineral rich grazing pastures that surround the town of Isigny-sur-Mer. 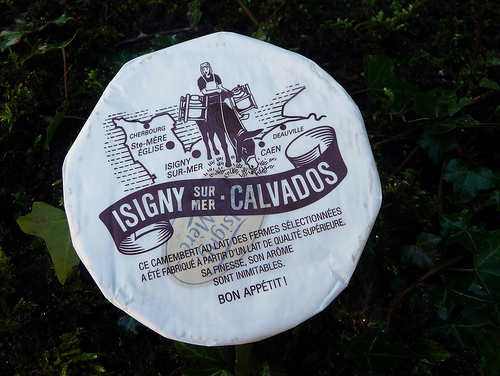 Camembert au lait cru, mimolette, pont l’évêque and AOC butter are a few of the products that bear the Isigny Sainte-Mère name, a name that is now well known all over the world. Around 40% of the dairy products produced here are exported to places as far away as Thailand, Mexico and Australia. 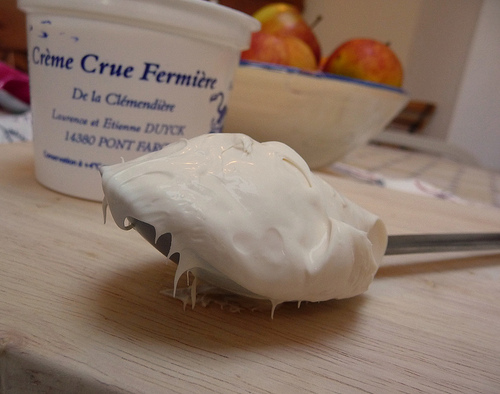 It also holds the distinction of being the only producer of a recognized AOC crème fraîche, the AOC Crème d’Isigny. Attached to the cooperative is a boutique that is famous for its luscious homemade ice cream, available every summer. Eugène Graindorge made his first livarot in 1910 and the rest, as they say, is history. Now in the capable hands of Thierry Graindorge, the 3rd generation fromager in the family, La Fromagerie Graindorge also produces pont l’évêque, camembert de Normandie, neufchâtel and le grain d’orge, all made using traditional methods. After a fire destroyed the fromagerie in 1999, a new facility was constructed, complete with a “Village Fromager,” which is both a museum and a place to view the cheese making and maturing process. Visits with an audio guide last about an hour. These carrots can only be grown in and around eight villages close to the Créances basin which is on the west coast of the Contentin peninsula in Normandy. 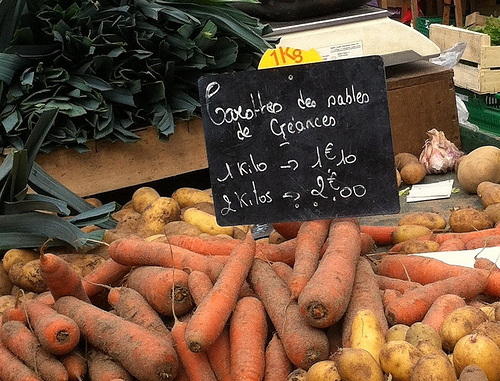 The carrots are grown close to the sea in long, narrow fields (strips really) called mielles. The very sandy soil has been fertilized with seaweed for generations making it rich in iodine and sulphur.